Building new networks for high-speed trains could help relieve road congestion, reduce journey times and help boost the economy. An enormous traffic jam formed on Nov. 30 on the M10 highway between Moscow and St Petersburg, stranding motorists for three days and causing $5-6 million in damage, according to preliminary estimates. Experts argue that the situation was caused by excessive traffic and warn that such a road crisis might happen again. Hopes to solve the traffic problems are being pinned on the construction of a dedicated high-speed railway between the two capital cities. That line would be used for passenger travel freeing the existing train line for cargo traffic. “When so many transport corridors connecting cities are prone to bottlenecks and it’s hard to broaden them, high-speed railways might help to ensure the mobility of the population. They don’t require too much space and can carry lots of passengers. There is no other option”, says Martha Lorenz, a senior transport specialist at the World Bank. High-speed trains were introduced by the Japanese, who have almost half a century’s head start on the rest of the world. Japan opened the first Shinkansen high-speed railway line in 1964, as part of its preparations for the Tokyo Olympics. The high-speed train was so successful that the profits easily exceeded operating expenses, interests on the loan and depreciation costs. France launched a similar project later with the first high-speed line completed in 1981 connecting Lyon with Paris. Dozens of countries now have their own high-speed train networks – often dubbed 'airport killers' and 'railway saviours' – with Russia getting in on the act only this decade. The Russian rail operator RZD is looking to spend more than $200 billion to extend its rail network across 12,000 kilometres by 2030. It is predicted that this will increase rail passenger traffic to 34 million people a year and reduce the load on existing transport corridors considerably. 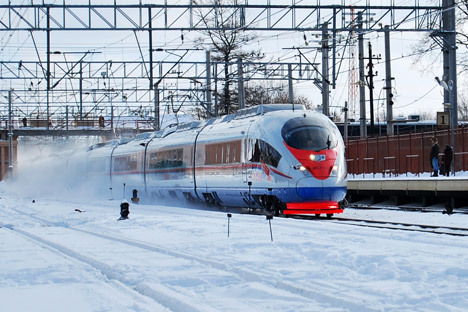 Russia is already developing railway projects for fast trains in the area between St Petersburg and Ekaterinburg. A separate line dedicated to high-speed trains could cost up to $35 billion. Sapsan trains runs a fast service between St Petersburg and Nizhri Novorod but it uses the existing railway lines that is shared with cargo freight and slower passenger services. Allegro runs a high speed service between St Petersburg and Helsinki. President of Russian Railways Vladimir Yakunin insists, in all his interviews, that these railways are indispensible and are the way forward for the country. Railway operators agree that better mobility might help address many of Russia's economic problems. Russian Railways hopes that developing the railways will create some 40,000 new jobs, help attract new foreign tourists and result in a boost to the economy of some 4 trillion roubles. In Spain, the new Madrid to Barcelona high-speed train service is predicted to create 136,000 jobs by 2016 says director for communications at Adif engineering company María del Carmen Palao Ibáñez. Although the train requires only about 500 specialists and another 550 security and cleaning specialists, 85pc of the jobs are created in the service sector, mostly in the restaurant business, retail, transport and tourism. Furthermore, Spanish economists have calculated that Madrid stores will sell an additional 2.8 million drinks, while museums will lure an additional 180,000-250,000 visitors. Deutsche Bahn said in a study that the ICE (Intercity-Express) helped many residents of smaller towns to find better jobs or increase their incomes by enabling them to reach big cities faster. Last year, almost 243,000 people commuted to Berlin on a daily basis. Since Sapsan trains began operating in 2009, its service has been in high demand. “It is impossible to separate the continuous development of cities from the impact that railways produce on them. But the fact that over 85 percent of all Sapsan seats are normally booked is quite indicative. If people use this service, that means their requirements are met effectively, and the fact that there is very little luggage means that Sapsan is mostly used for business trips”, explains Oleg Trudov, railways specialist at Institute for Natural Monopolies Research. He believes high-speed trains offer convenience because they take passengers directly into the city centres, as opposed to arriving at airports on the city outskirts. This makes them a competitor with airlines and forces them to cut their airfares and increase comfort levels. Nizhny Novgorod international airport reported that airlines had to cut their fares when the Sapsan line launched there in 2011. The airport also made amendments to its check-in rules, as check-in counters for passengers and luggage started to close 20 minutes before the departure for Moscow flights. Similar economic benefits in terms of job creation and relieving road congestion are predicted for the planned high speed rail network that will connect London and Birmingham in 2025. Andrew Meaney, managing consultant at Oxford’s Oxera, believes it will have an economic impact of about $ 33 billion, of which $9 billion will be from the time saved by using the faster train.